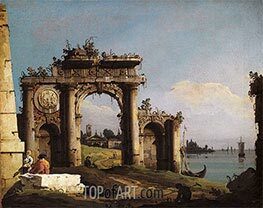 Bernado Bellotto (January 30, 1720, Venice - October 17, 1780, Warsaw) was an Italian landscape painter. 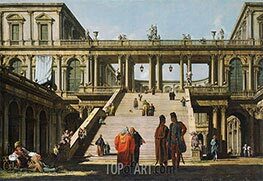 He was the pupil and nephew of Canaletto, and sometimes also used the latter's illustrious name - illegally according to some. His style was characterized by elaborate representation of architectural or natural vistas, as well as the specific quality of each place's lighting. Like his uncle and many other Venetian masters of vedute, he used camera obscura in order to achieve superior precision of his urban views. 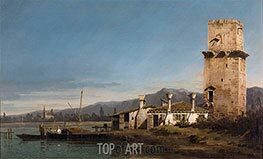 Bellotto's career was of strong international character. Traveling through Italy he visited Rome, Florence, Turin, Milan and Verona and created memorable images of each city. From 1747 to 1758 he moved to Dresden, following an invitation of King August III of Poland. 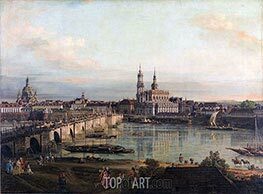 He created various paintings of the cities Dresden and Pirna and their surroundings. Today, these paintings preserve a memory of Dresden's former beauty, which was destroyed in the bombing during World War II. 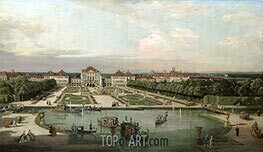 His international reputation grew, and in 1758 he followed an invitation by the Empress Maria Theresa to Vienna, where he painted views of the city's monuments. Thereafter he worked in Munich and then Dresden, again. While working in St Petersburg, he accepted the invitation of Stanislaw Poniatowski to become his court painter. His paintings of Warsaw were used for rebuilding the city after its near complete destruction in World War II.